For the last five-and-a-half years of Ronald Reagan's presidency, Pete Souza worked as one of the Gipper's personal photographers. With the intimate access granted to a White House photographer, Souza put together a remarkable collection of historical photographs of the 40th President of the United States. From negotiations with Gorbachev to White House dinners with Princess Diana and John Travolta, Souza's photos provide a rich visual history of the 1980's in America. 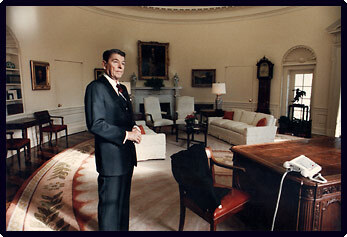 Listen along with audio comments by Pete Souza about his experiences with President Reagan. All photos ©2002 Pete Souza. All rights reserved.